Year-over-year home sales increase in October and prices rise to record highs for the month. 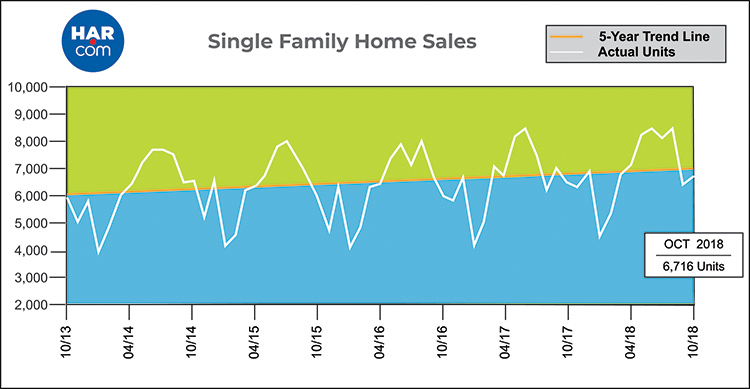 After two straight months in which Hurricane Harvey and its aftermath quite obviously affected year-over-year sales numbers, Houston’s real estate market seemed to normalize in October. 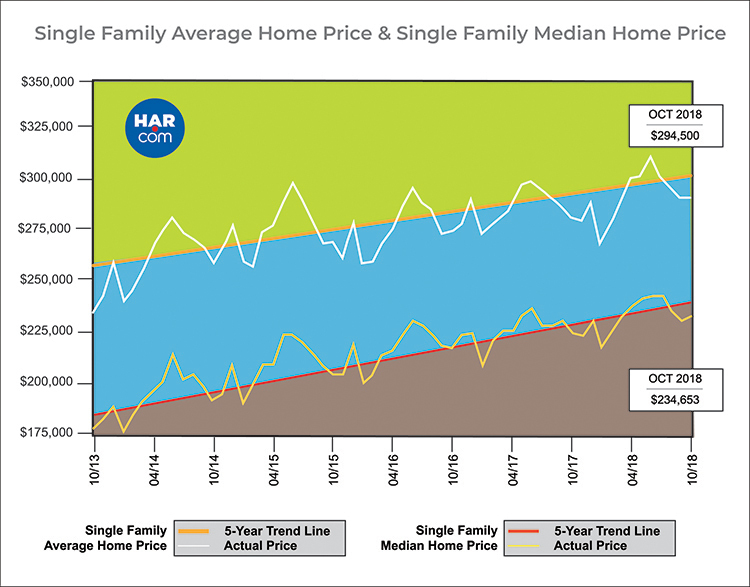 According to HAR’s November report, year-over-year single-family home sales increased and prices rose to record highs for a Houston October. And while inventory remains a concern, Houston’s year-to-date home sales are still, quite spectacularly, 5.3 percent ahead of 2017’s record-setting sales pace. Because of Harvey, August 2018 single-family home sales were irrationally higher than those in August 2017, and a dramatic post-Harvey surge in sales meant that September 2018 home sales were notably lower than September 2017 sales. October sales seem to fall more in line with what we have seen for most of 2018, with a 4.7 percent year-over-year increase (from 6,417 to 6,716). Pending sales also were on the rise, climbing to 7,039 at month’s end, compared to 6,676 the year prior. That amounts to a 5.4 percent increase. Single-family home prices, both average and median, grew to record levels for an October in Houston. Median price shot up 3.6 percent, from $226,550 in October 2017 to $234,653 this October. Average price saw a 3.5 percent year-over-year increase, from $284,659 to $294,500. Supply continues to struggle to keep up with Houston’s robust demand. Inventory currently sits at 3.9-months supply, which is well below the national inventory of 4.4-months supply. There are a couple of positive indicators concerning inventory though, as it is indeed up from 3.7-months supply this time last year, and year-over-year active listings increased 7.3 percent to 41,061. Barring dismal sales in November and December, it looks as though we’re likely to finish 2018 with a new record for sales in a year, but if we want to see a healthy market moving forward, we’ll need steady growth in inventory. Buying or selling a home or have questions about the market? Give me a call at 713.829.3052 or email me at cynthia@cynthiamullins.com. RECENTLY SOLD in Houston Heights! 936 Arlington Offered at $529,000.